5 Days Primate Safari Uganda Gorilla Safari & Uganda Chimpanzee Trekking Safari Kibale Forest National Park. 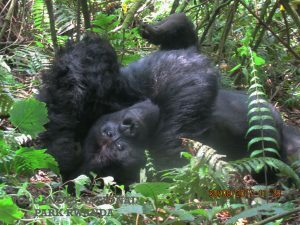 The Safari takes you gorilla trekking to Bwindi Impenetrable National Park, Chimpanzee Trekking Safari in Uganda Kibale Forest National Park & a Uganda wildlife safari Queen Elizabeth Park The 5 Days Primate Safari Uganda Gorillas & Chimpanzee Safari Tour exposes you to man’s closest relatives i.e. 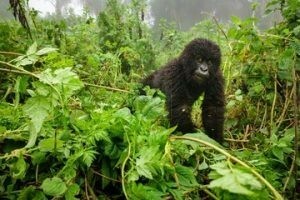 mountain gorillas and chimpanzees. The encounter takes you through challenging but rewarding gorilla trekking in the Impenetrable park of Bwindi, free game viewing along the transit road in Queen Elizabeth and finally Chimpanzee trekking in Kibale National Park. 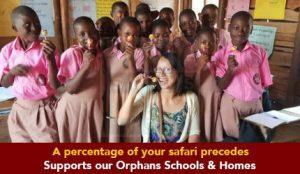 The Bigodi community tour and the Nakayima tree encounter add spice to this 5 Days experience. Embark on the journey to the southwest of Uganda after an early breakfast at your place of stay in Kampala. After 77km, you will make a stop at the Equator crossing – Kayabwe for photo shooting and participating in the water experiments to evidence the separation of the northern and southern hemispheres. A continuous drive through the farmed hill sides and the urban environments of Masaka will eventually lead you to another stop at Igongo cultural center 12km to Mbarara town for lunch. The delicious meal at Kahwa Kanuzire restaurant will give you a taste of traditional cuisine. 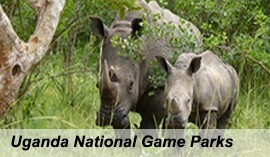 Proceed on your drive to Bwindi Impenetrable National Park to arrive in the evening for relaxation and overnight. After your early morning breakfast, gather at the Park Headquarters Buhoma for briefing from the park rangers about the conduct of gorilla trekking activity. After the short briefing, you embark on the challenging trek through the impenetrable jungle of Bwindi with its rugged landscape involving valleys, swamps, steep slopes and rocky areas amidst amazing jungle sounds and bird songs which is an attraction in its self. 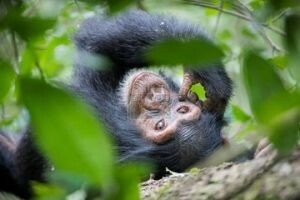 You will finally come across these endangered apes in thriving in their ancient habitat foraging or socializing. You will marvel at the gorillas as they welcome you, interact and finally say bye when your one hour with them is used up. The opportunity to take as many photos as you can is availed to you while asking questions to your guide about these apes is up to your discretion. Retreat from the activity to the lodge for relaxation. Trekking duration: 2 – 8 hours. Accommodation:You will have dinner and overnight at your previous lodge. After breakfast embark on the transfer to Kibale National Park. You will pass through Queen Elizabeth National Park where by luck; you can see the tree climbing lions of Ishasha if they are close to the road. Other wildlife can also be viewed along the road through the park. 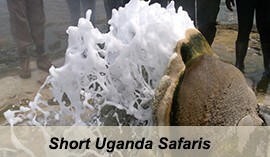 Continue with the journey to Kibale with stunning views of the snowcapped Ruwenzori Mountains. You will arrive in the afternoon for relaxation and overnight. Accommodation: Primate Lodge (Upmarket/luxury), Chimpanzee guesthouse (Midrange/standard) or Chimps nest (Budget/Basic). After breakfast, gather at Kanyanchu tourism center for briefing at 08:00am from the park rangers about the Chimp trekking conduct. Set off to this forest of Kibale after the short briefing in quest of Chimpanzees. The 2 – 5 hour trek will expose you amazing tree species and wildlife including other 12 species of primates like Colobus monkeys, vervet monkeys, Red tailed monkeys and olive baboons. The sights of Birds cannot be avoided while their songs will offer you natural entertainment through the jungle. You will marvel at the Chimpanzees as the roll themselves on tree branches, munch fruits and make their pant – hooting calls. After utilizing your one hour, you will return to the starting point for relaxation and preparing for another activity. In the afternoon, you will visit the Bigodi wetland to encounter the swamp animals like Sitatunga and birds like Ruwenzori Turaco and an encounter with local people including the traditional healer. 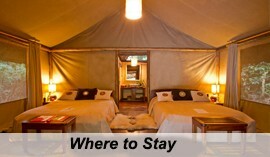 Accommodation: You will have dinner and overnight at your previous lodge. Day 5 of the 5 Days Primate Safari Uganda Gorilla Safari Bwindi Uganda Chimpanzee Trekking Safari Kibale Forest: Transfer back to Kampala. After breakfast embark on the drive back to Kampala. You will branch off a little in Mubende to visit the Nakayima tree an ancient tree with great attachment to the Chwezi people which is apparently used as a traditional shrine. 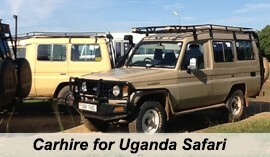 Continue on the drive to arrive in Kampala in the afternoon.